It took me too long to publish this post even it was ready since 16/5. but the main reason behind it was that the responses I got on the previous "Can't it be prevented?" posts were mainly from people from outside Jordan, I do appreciate all the responses since it is for the benefit of all, but I was hopping for more local involvement from the local canioneers of Jordan, it is bitty though but I will keep posting for the benefit of all. In the previous two posts of the series (Cant it be prevented?) we had an introduction to canyoneering and its hazards in the first post, and then we discussed the need of a code of conduct that set a base of understanding for the minimum level of accepted standards for both canyoneering operators and their guests. I believe the first step of having a code of conduct is to understand the canyons we have in Jordan and trying to categorize them based on the obstacles and needed skills for each. Two years ago, I have set a categorization with the help of the information and discussions been held by the members of the committee – that we were trying to establish then- through the meetings we were holding. 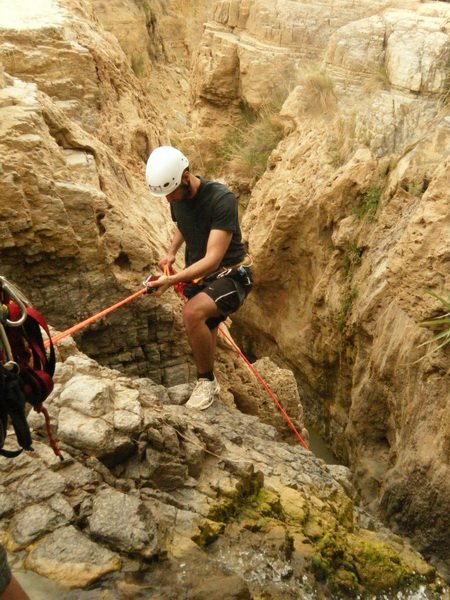 Below is the method I used to categories the trails that is done by the different canyoneering teams in Jordan. No rappels, rope normally unnecessary for normal progress. Easy climbing and down climbing with little exposure. No water or calm water (Swimming optional). Long trail distance –for One day-. Rappel anchors are easily reached. Rappels are easy. <= 30m. Rappels are separated by enough room to regroup. Climbing: A little exposure, which may require the use of a rope. Simple jumps less than 3m. Short or moderate angled slides. Rappels land in pools with calm water. Rappels anchors are difficult to reach and/or Rappels > 30m. Climbing: Exposed and/or requires belaying and protection. More than one day trails –Easy Trails With a long Distance-. More than one day trails –Moderate or Advanced Trails With a long Distance-. Multi -pitch rappels with relatively spacious re-belay stations. Retrieving the rope is difficult. Natural canyons may present opportunities for easy, moderate, advance and master trails. Outdoor leaders must make the distinction prior to embarking, although land managers may have previously made this distinction. The final decision on the risk management of the canyoning activity requires the judgment of the outdoor leader. Such judgments will vary on a site-by-site, group-by-group and day-by-day basis with the height above ground and landing surface being the key determinants. Additional activities in the canyon can raise up the canyon level, but it still Optional for the leader and the guests to decide. In the next post I will try to discuss the planing needed for each of these grads. And in further posts I will discuss each of these trails alone to find a data base for all needed information about these trails.